We live in a walled-off world—walls we erect because we’ve been hurt by someone or several someones. It seems easier (and safer) to protect our hearts at any cost, brick by brick. But the problem comes when that wall becomes the very fortress that prevents joy in our lives. I’ve suffered relational heartache. So much so that my walls became towers of protection, and I hid my heart from risking with people. Because people are shifty, and, in my mind, were bent on hurting me. Better to build, brick by brick. But if I’m completely honest with you, I am sad to say I’ve caused relational heartache. I’ve injured. I’ve been the cause of other people building walls. I wish it weren’t so. So here we sit with pain between us and the people in our lives. We’ve hurt. They’ve hurt. And the wall grows. There has to be a way through, right? There must be more to life than expending extreme amounts of energy in self-protection and preservation. What if we could find a way through the pain? I believe there is, which is why I wrote The Wall Around Your Heart: How Jesus Heals You After Others Hurt You. As I walked through my own relational pain and learned to deal with the bitterness that had enabled me to build a huge wall around my heart, I knew the only way out was Jesus. As the most openhearted person to walk this earth, all I could do was ask Him to please-please-please show me how to move on and live the joyful life that always seemed elusive to me. And He showed me. Boy did He show me—through His own words. The Wall Around Your Heart is the journey I took from embittered to openhearted, from living in reaction to the past to living joyfully in the present tense. The pathway I take you through is simply this: The Lord’s Prayer. Did you know that this prayer is relational? Did you know there are secrets embedded in this prayer that will help you move on after heartache? Did you know this ancient roadmap will teach you how to have the life you’ve longed for—a life of abundance and hope—even after people hurt you again? After reading The Wall Around Your Heart, not only will you reframe your relationships and learn to live openhearted, but you’ll never pray The Lord’s Prayer the same way again. This pathway has utterly, truly changed my life, and it’s my sincere prayer that it will radically alter the course of your life. So if you’ve built a great big wall around your heart and you’ve finally grown tired of living in isolated fear, consider picking up The Wall Around Your Heart. Read through the Lord’s Prayer using the PDF here. Ask, which part of the prayer am I having the most difficulty with in my relationships? Ask a close friend, “Where do you see me putting up walls around my heart?” Dare to listen! Write a letter of forgiveness to someone who has hurt you. Don’t mail the letter. I don’t want to have a great big wall around my heart. I realize it protects me, but it also prevents real joy in my life. Give me the guts and bravery I need to tear the wall down, risk again in healthy relationships, and be an openhearted person. Give me courage, Jesus, because I need it. Mary DeMuth is an author and speaker who loves to help people live uncaged, freedom-infused lives. She’s the author of fifteen books, including six novels and her critically acclaimed memoir, Thin Places. After church planting in Southern France, Mary, her husband, and their three teenagers now live in a suburb of Dallas. Find out more at marydemuth.com. Family members hurt us. Friends betray us. Fellow Christians deceive us. But Jesus provides a path through the pain—the Lord’s Prayer. In The Wall Around Your Heart, Mary DeMuth shows you that you can reach wholeness and healing in the aftermath of painful relationships by following the road map of the Lord’s Prayer. You’ll walk through story after story of hurt people who are led through biblical truth into amazing, life-sustaining, joyful growth. Allow God to access the wall around your heart. Dare to say, “Tear down the bricks, Lord, whatever it takes.” Pray first. Ask for bravery—for yourself and for others. Risk engaging despite your hurt. Seek the shelter of Jesus. You don’t have to resign yourself to your wounds! You can rise above the pain. You’ll usher in a new life—an openhearted way of relating to others that expands the kingdom of God. In the process, you’ll draw closer to Jesus, be healed, and become an agent of healing to others. 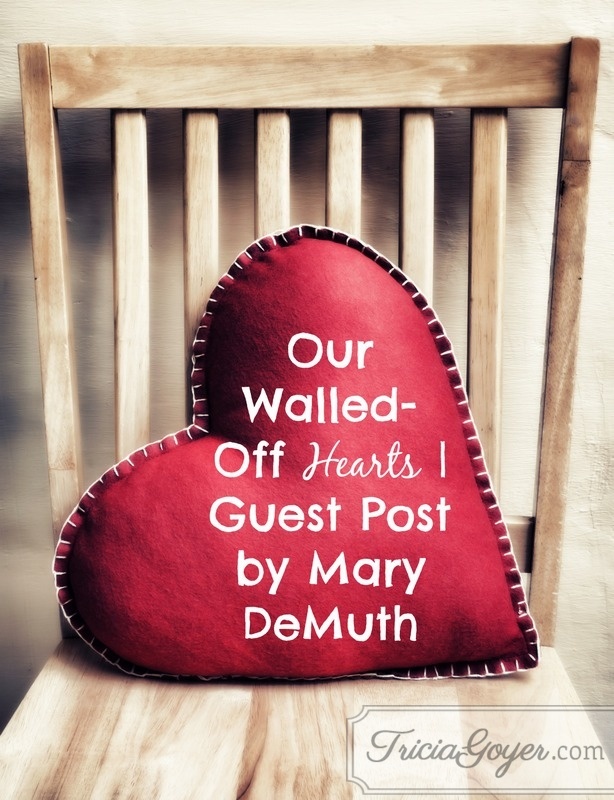 Mary is giving away SIX copies of The Wall Around Your Heart! Enter below. Only those in the U.S. are eligible to win. This is something the Lord has been laying on my heart recently, and something He’s been working on. Too many walls….but He’s helping me dismantle them, brick by brick. I loved Mary’s “Everything” & would love to read this one as well. To answer the question, at this point in time, I am not sure how to tear down the wall regarding some relationships. Thanks for the opportunity! Blessings! Love reading the blog. And I love give-a-ways, thanks! Being intentionally vulnerable and transparent is one way I’ve found to help dissolve the walls in a relationship. It’s tough to intentionally lay down my defenses (and the right to be right) when I know I may be hurt. But sometimes it’s the only way healing can happen. Living crucified. I appreciate your books, Mary, and would like to read this one, too. on the other side waiting for me to tear down the walls. I cannot do it myself! With God’s guidance and forgiveness I will begin this process. I also use the support of fellow Christian women. A huge blessing in my life! thank you for the giveaway. this book is on my wish list. This can only be accomplished through prayer and the Holy Spirit. By my own strength, the inner ‘me’ does not truly desire to be exposed, and is content to communicate with God, alone. To me, the only answer that’s foolproof–though it still takes time–is prayer. My teenage years were painful (mostly because of my own choices), but over a decade later, I can say I truly feel the Lord has totally healed me from those wounds. I have built a huge wall around my heart since my son died suddenly Jan 18, 2014. I loved him so much and he was my world, was what I lived for every day of my life. When he died so suddenly, I blamed God and swore I would never love again. Ya see I had wanted a baby boy since I was about 5 yrs old when I learned my Daddy had another name besides Daddy. His name was Samuel and I thought that was the prettiest name I had ever heard! So from then on, all my doll babies were Samuels, Sammys, Sambo, Sam and even the girl dolls were Sammi, Samantha, Samela, etc etc. Then I met this handsome man named Samuel !! whose Dad’s name was also Samuel!!! I knew this was who I was going to marry! And we did and had our little Samuel that I had always wanted!! Life was so good and I was so happy for 46 years 9 mos. 3 days. Now my life is over and the wall is built that I do not want to love again, dont want to talk or hear about Jesus, dont want to live. Why? because loving and losing has hurt so bad, that I will never love like that again. My heart is in a million pieces. I did enjoy your interview and the review of your book and it sounds like a good one, Thanks for the opportunity to enter your giveaway and maybe if I should win it, there may be something in it that would help me. I love reading all the Christian romance and suspense books but a lot of the things that are spoken concerning the Grace of God, I no longer believe. I was a good mother, devoted and loyal, and was a Christian and lived right, but still it mattered not. This post is timely for where I am again today. So ready to break that wall DOWN. Can’t wait to read the book. I’ve built a wall around my heart and know that I can’t tear it down without Jesus Christ. I pray that God will reveal to me how to get past my hurts and how to have the joyful life that he has planned for me. One way I build walls is to not continue to have a full relationship with those who have hurt me. There are people I purposely keep on the outskirts so that I don’t have to deal with them. I dont know how I’m going to do it but I will pray for God to lead me. I plan to tear down the walls around my heart by writing the letter you suggested. I’ve done this before where I’ve sent the letter, perhaps not sending it would be better. The person I addressed my letter to didn’t feel like he had done anything that he needed forgiveness for. Hopefully by reading this book I will learn how to tear down the walls. I probably need to forgive and forget any who have wronged me. By staying grounded in the Word of God and by lots of prayer. I am very inspired by your post and will add these thoughts to my prayer. I have been trying to destroy the walls by attending church., talking with others about my struggles, asking others to pray and attempting to be open with God. I’m going to begin praying the Lord’s Prayer daily and asking God to break down the walls that I have built around myself. Its so difficult to do. Maybe the first step I need to take in tearing walls down is realizing I have built some up in the first place. Not with everyone, but most definitely with some. Those I’ve been hurt by ( when I thought things were healing). And those that outwardly appear to play those relationship type games. Sounds like a great read and a must read for me. Awesome giveaway! I plan to make a conscious and concentrated effort to do so, while remaining much in prayer. I cannot do anything on my own, but with Jesus, I can! That is a very hard thing to do, but with my husband’s help, I am slowly chipping away at my wall. It is about half gone now. I want to kick the wall down! I have to Daily ask the Lord to help me keep forgiving the person who keeps betraying my trust! Love finding new authors to read. You need lots of faith and then you need to pray to bring down those walls. I would love to have this book! I was just mourning the fact that I don’t have close friends in my life, probably because I have WALLS!! I plan to tear down walls I have built by making an effort to reach out and connect with others, instead of waiting for others to approach me. I am co-leading a ministry and volunteering at church to stay in community and make myself accessible to others. BIG change for me, but a much overdue one! I plan to tear down walls but not letting fear control my life any longer. I’ts been a lifelong struggle for me. It’s time to break them down! I would love to read the book to help tear down my walls! I am going to forgive and trust in God to me learn to trust in humans again. Just to smile & rejoice in this day! What a great idea for a book. We are so cautious when our feelings involve our family…it’s tough! I don’t know if I have a wall around my heart or not. I feel like I am a very open person. But as I said that I realize that I am quite lonely. I have gotten used to my little life with my retired husband and our two puppy dogs. Other than my daughter and her husband and my husband’s daughter no one else comes over to our home. I rarely meet up with friends anymore. We attend church and eat out with another couple afterwards. We go to our small group and I participate in my women’s Bible Study but no one comes over to our home. I have created an isolated life. So maybe I do have walls. I need to pray about this situation and ask God what He wants of me. Thank you for your words and getting me to think about my life, Mary! Hard question to answer! I can only do it piece by piece with the Lord right there beside me. I need this book! Since I was a little girl I discovered that the easiest way to escape hurt was to build a wall around myself. I always envisioned myself in my own little garden, with a brick wall built all around me, and I believed I was at peace there. I found as I grew though that spiritually and emotionally I was stuck the same age of that little girl that lived within those walls. They were not only preventing close friends and family from reaching my heart, they were preventing God from doing the same. Since then I’ve learned to bring down those walls, through prayer, devotional time, reading, and painting. All things that I can do while spending one on one time with God. It is through Him only that I am slowly taking down those walls, one brick at a time. I am beginning a personal letter.writing campaign of sorts to the influential women in my life..
Purposely beginning with some who have brought me great pain as well as investing in my life, declaring that even as I write to them of those positive memories, that I’m releasing forgiveness over them and healing/freedom in my own life. I hope to tear down my walls through prayer and patience. Thanks for the give-away!